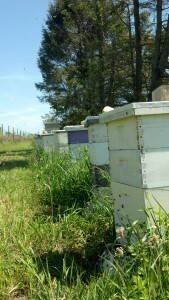 I love how bees and beekeeping have introduced me to so many wonderful people. Wendy from Sayville e-mailed me in April about her upcoming wedding this June – she loved the Blossom Meadow 2 ounce Honey Bears (aka “Bear on the Go”) and wanted them as her wedding favor. It is so hard to predict how much honey the girls (only female bees make honey) are going to produce each year and the beginning of June is the beginning of when honey is ready for harvesting on Long Island. Wendy is so sweet and I loved the idea that my bees were going to be part of her special day. Knowing that I had some really strong hives and that I really wanted to be part of Wendy’s day, I said yes. I bet the bees were pretty surprised to see me so many times this past May but I had to be sure that there would be enough cured honey for Wendy, just in case she had to go with Wedding Favor Plan B (she said that she had a plan B but I was too nervous to ask what it was to tell you the truth – I was 99% sure my bees would be ready to provide for Wendy’s Wedding). Well, happy to say that Wendy and her fiance now have Wedding Favor Honey Bears and I have enough harvested honey for more bears and jars for the Blossom Meadow Honey Club and to sell at the Greenport Farmers Market this Saturday. 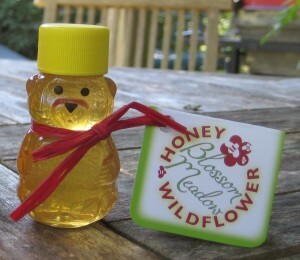 The 2012 Honey Season has begun and 170 Blossom Meadow Honey “Bears on the Go” are going to a wedding! Thanks Wendy, for believing in me and my bees.